At Armature Coil Equipment (ACE), we work with a lot of customers, who specialize in repairing industrial motors and generators. Many of these customers have requirements to refurbish custom stators for their motors and generators. Hence, we receive enquiries for equipment that can help them accomplish this task. For customers with such needs, we provide the Model No. 750 Cut Off Saw, as part of our coil winding equipment range. 4. Shipping Weight 325 lbs. 5. Crate Weight 400 lbs. An optional floor mounted turntable can be provided to enhance the maximum motor frame range. This can help increase the maximum range from 36ʺ to 48ʺ. The same turntable option can be provided to enhance the motor frame length. The use of the turntable can increase the maximum length from 20ʺ to 36ʺ. ACE also provides options for the maximum outer frame edge reach to the stator laminations. An optional spindle can be provided to increase the dimension from 6ʺ to 8ʺ. Generally, stators comprise electrical steel laminations, which are made from steel coils. The lamination pieces are stacked together to form the stator core. If any of these laminations get damaged, the stator will not be able to function properly when used in a motor. 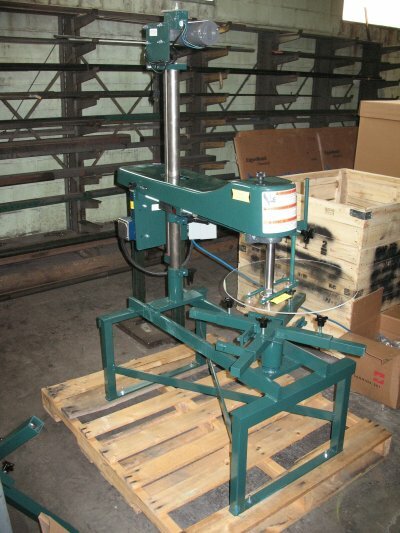 This product is specifically designed to cut stators for wire removal and rewinding processes. 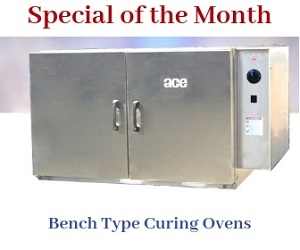 In stator manufacturing and refurbishing processes, the ACE cut off saw can be used along with burn off ovens. It is also used in cohesion with sandblasting or chemical stripping operations. The electric motor is connected to the swing arm to ensure fast and precise cutting operations. Place the stator on the turntable, and secure it in the holding arms. Turn the spindle post crank to lower the saw into the bore of the stator. The height between the saw and the laminations should be approximately 1/8ʺ. Turn on the saw and begin the cutting process. Use the foot pedal to adjust the speed. This will also keep your hands free to move the stator during the cutting process. Swing the saw in and out of the winding. Ensure that you rotate the stator each time the saw is moved out of the winding. Once you have completed the cutting process, the wires within the stator will need to be loosened and removed. We recommend using an ACE burnoff oven for this operation. Place the stator in the oven, and process it to loosen the wire. Once this has been completed, remove the stator from the oven, and allow it to cool. When the stator has cooled, the wires can be easily removed either by hand, or using a mechanical puller. When the wires have been removed, you can strip the stator by sandblasting it, or using a chemical stripper for the final clean-up process. When all these steps have been completed, the stator slots can be sent for rewinding. For 7ʺ and 8ʺ diameter cutters, it is recommended to use the low speed pulley. We recommend using the high speed pulley, if you are using cutters up to 6ʺ diameter. Always wear protective clothing and a face shield for protection when using the cut off saw. Ensure that the cutter guard is in place when you are operating the cutter outside of the stator base. The saw guard should be raised when cutting the bore interior. Do not crowd the saw, i.e., do not use it continuously to cut multiple stators one after another. This can causes the abrasive wheel and other components to wear off sooner than expected. 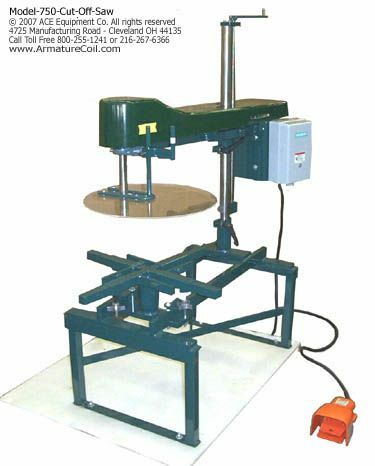 Complete knowledge of the machine, its operating procedure, and performance tips can ensure that your experience with Armature Coil’s Model 750 Cut Off Saw will be extremely positive.